Plasma cutters allow you to cut through an array of materials ranging from aluminum and copper to stainless steel without facing any issues. Its basic function is to convert oxygen, nitrogen or argon gas into the fourth state of matter or plasma. In the plasma cutting process, a gas is primarily blown through an extremely small nozzle with the purpose of increasing its velocity. The high-velocity gas is then passed through an electric arc for enhancing the temperature to such an extent that the gas is altered into a highly efficient form of matter which is termed as plasma. A super-heated torch is produced as a direct result of this process which is capable of slicing through metals. The cutting surface is occupied by plasma thus making the whole work seem a lot easier. All plasma cutters do not come with built-in invertersbut the ones which do, come with a hefty price tag. The inverter takes direct current and feeds it through a high-frequency transistor inverter ranging from 10 kHz to 200 kHz thus adding to its portability. Plasma cutters operating on 110/220V wall outlets are comparatively cheaper and restricted in terms of operations. Plasma cutters which cost a bit more can work on 220/240V and cut through thicker materials.Power specifications determine the thickness of metal which can be cut with the plasma cutter in a hassle-free manner. Plasma cutters make use of electrical currents for generating the cutting arc which is measured in terms of amperage. Consumers need to match the amps along with the thickness of metal they wish to cut and the source of power they shall be using. It is imperative to note here that amperage holds a positive correlation with the cutting speed. 25 amps will suffice metal having a thickness of ¼ inches whereas 50 amps is required from slicing through ½ inch metals and 80 amps can cut through ¾ to 1 inch thick metals with utmost ease. 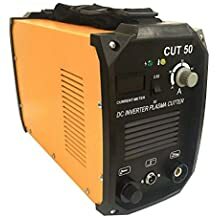 All plasma cutters need to have a power switch and some other way of adjusting the current setting depending on the type of metal which is being cut. Modern day cutters even have LED indicators located at the front of the panel making it easy to read the signals although they might cost a bit more. A plasma cutter having more amperage output will offer higher duty cycle which can suffice your requirements if you intend to work for longer time spans. This reliable plasma cutter can suffice both your home projects and smaller industrial tasks. It delivers strong cutting performance in a durable and compact package which can withstand usage in an array of environmental conditions. Its optimized design which has drawn inspiration from MOSFET transistors paves the way for high power output with thick metal cutting and steady output for thin metal cutting. Powerful DC welding current is generated by the inverter power supply coupled with Pulse-Width Modulation technology. The air plasma cutter is well braced to take on alloy steel, stainless steel, copper, mild steel, aluminum and other metals with the stellar combination of precision cuts, high speed and low cost. This dual-voltage, 50 Amp digital plasma cutter offers an array of advantages over oxy-fuel units. They come easier on one’s pocket, requires less maintenance and does not pose as much of a fire safety hazard. The torch trigger can be set to custom fit and used in finger or thumb positions. It becomes easier to use the plasma cutter in tight places given its low torch head profile. The duty cycle caters to the power requirement of smaller projects while the high frequency operation reduces metal distortion and hikes up speed. Coupled with such attributes, the Lotos LT5000D can be the perfect choice for automotive repair, plumbing, light salvage, construction and pipe fitting jobs. Comes with a year’s warranty. Easy to see readings and controls. High frequency operation paves the way for finer cuts and less slag clean up. It might take novice users some time before they learn the art of mastering cuts. Plugs need to be attached to the power cord by the user. Does not come with power plugs. You are bound to be spoilt for choice with the Primeweld Ct520d plasma cutter which offers three different combinations in a compact machine. 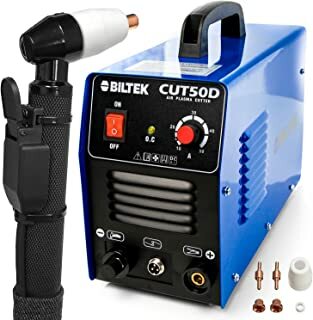 You can use it either as a stick welder, TIG welder or plasma cutter wherein it can operate at up to 200 amperes for the first two and up to 50 amperes for the latter. It also offers easy toggling option in between the different functions. The dual voltage capability makes it easy to switch automatically between 110 and 220 volt options which can come in handy if you are working in a place where any one of the power source is unavailable. Weighing at just 36 pounds, the unit can be carried around easily from one place to the other. The welding process can be regulated easily by the built-in air gauge. Some other stellar attributes of the Primeweld Ct520d are its 85% power efficiency and 60% duty cycle which helps in cutting through various forms of metals having a thickness of ½ inches. Another feature which sets it apart from its contemporaries are the high-quality consumables and accessories such as electrode holder for stick welding and TIG torch which is bound to satisfy you from the very first use. Comes with a 3-years warranty to keep you covered from manufacturing defects. 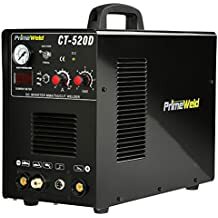 Compared to other units, it is easier to switch from DC Stick welder to DC TIG welder using the Primeweld Ct520d. High level of portability guaranteed by its compact and lightweight built. 3-in-1 combo offering saves the extra cost of purchasing three different machines. Durable enough to last through heavy duty usage and in harsh environments. Instruction manual containing just generic insights about various Primeweld modelsis not of much help. Machine lacks a proper pilot arc which might pose as a problem in case if you require automatic cutting. 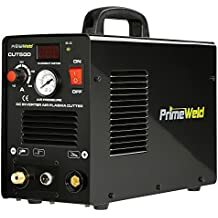 Given its supreme value for money, the Primeweld Cut50 can surely be tagged as one of the best bargains available in the market for plasma cutters. This inverter-based plasma cutter weighing at only 22.5 pounds can consistently cut through 5/8 inch of mild steel and ½ inch of stainless ones. In spite of coming light on one’s pocket, it also offers extreme flexibility which in turn paves the way for fine level of control while proceeding with thinner materials. Coupled with such attributes, this plasma cutter can easily suffice the requirements of both professionals and hobbyists working at a home shop or farm. Setting up the device is extremely easy as it follows the general standard. You might feel the requirement of a good air compressor for ensuring proper operation. Skimping this step can adversely impact the cutting performance. The Primeweld cutter can glide through alloy steel, stainless steel, copper, mild steel, aluminum and other metals with extreme precision. Its dual voltage options of 110 and 220 can offer you with greater versatility. It comes much cheaper than the Oxyacetylene and is easier to clean and maintain. You can also be guaranteed of complete protection against the fire hazards and emission of noxious gases while operating with this device. User friendly carrying handle to help with easy cuts. Optimized design providing steady output for thin metal and high power output for thick metal. Cuts faster with next to none distortions. Comes with 3 years of manufacturing warranty and 1 year of torch warranty. Lacks pilot-arc capability and CNC control. The Zeny Cut-50 can serve as the perfect option for a DIY hobbyist whose job requires cutting of metal sheets into different sizes. You can be guaranteed that your metal wont warp which is usually the case while cutting with jigsaw and other cutting tools. It is accompanied by a cutting torch LG-40, 2 plasma tips, air pressure regulator, grounding clamp, user manual, chipping hammer/wire brush, welding face mask and air pressure reducing valve. This auto dual outlet machine can operate in two ways which also explains the absence of air hose or plug with the package. The plasma cutting machine can easily slice through stainless steel, aluminum, copper and other metals with absolute precision. The final result however depends to a great extent on the cleanliness of metal you are working upon. Dirt in the workplace is bound to reflect on the plasma tip. In spite of the cleanliness, the plasma cutter can glide through thickness of 1-12mm in a hassle-free manner. There is also a 2.5-5 seconds’ delay switch and 7 to 8 feet long heavy duty cord which comes attached to the plasma cutter for increased productivity. 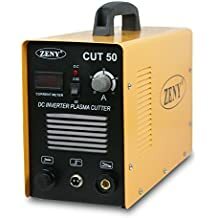 Coupled with such features, the Zeny Cut-50 can easily be used in sheet metal fabrication, ducting work, automotive, light industrial work, repair and maintenance services and many more. Lightweight design makes it easy to be carried around from one job site to another. Easy to set up with no requirement of professional skills. Comes with a low-price tag which is bound to delight plasma cutting professionals running on a stringent budget. Can be used for cutting various types of metals. User manual is not very well organized. Not meant for high grade cutting of metals having thickness of more than ½ inch. Air hose and plug needs to be purchased separately. 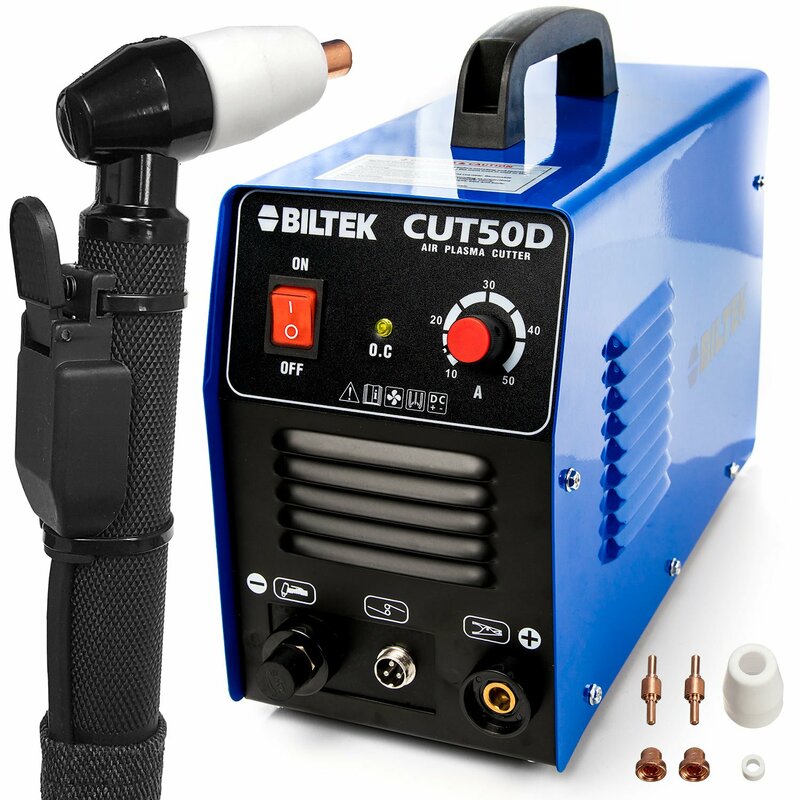 You can easily cut through metal like alloy steel, stainless steel, copper aluminium, sheet metal and mild steel having varying levels of thickness coupled with the Biltek 50Amp Air Plasma Cutter. Minimal slag is produced by this dual voltage plasma cutter as it works through painted, rough and even rusty surfaces. This is accomplished by blowing a compressed gas towards the work piece through a focussed nozzle and at super high speed. Such mechanisms lead to the formation of an electrical arc either within the gas, the work piece itself or between an electrode, near or embedded into the gas nozzle. In spite of having a high cutting speed, this device does not create much ruckus which can disrupt the normal work proceedings either of your colleagues or family members. This dynamic plasma cutter is crafted using heavy-duty materials which guarantee its longevity in spite of being subjected to rough usage. It is accompanied with one cutting torch, one ground clamp, one air hose, one air regulator and six replacement consumables. The longevity of consumables is increased by its non-pilot arc torch. Versatile cutting torch can seamlessly work through ½ inch thick steel. Advanced Inverter Technology leads to longer running times and better duty cycle without making the plasma cutter too hot to touch. Offers optimal cut through 8mm thick steel, maximum cut through 10mm thick steel and severance cut through 12mm steel. Accompanied by a huge array of accessories which can get you started with your welding operations almost instantaneously. Portable plasma cutter which can be set up easily by following the accompanying user manual. 220V plug has to be purchased separately. A separate air supply is required from an air compressor. This high frequency plasma cutter works extremely well in welding industries as its PRO technology paves the way for more stable performance. Its high duty cycle leads to low power consumption thus making it more efficient and economical when compared to traditional cutting aids. Crafted using heavy duty iron, the Super Deal Cut-50 can cater to the requirements of both DIY and professional users for long spans of time without undergoing any machine downtime. Its digital LCD display makes it easy to understand the air pressure while saving energy and reducing the emission of noise which is infamous for causing distraction in the job site. The plasma cutter comes with a mask and wire to prevent minor injuries which can happen while using the device. It also comes loaded with numerous other functionalities in the form of over-voltage protection, over-heat protection and under voltage protection which makes it the perfect choice for being used in automotive, site work, sheet metal fabrication, light industrial use, repair and maintenance etc. Works exceptionally well on thin metals. Low energy consumption leaving less environmental footprint. Clear display screen for easy viewing of data. Long service life and good heat dissipation. Continuous current regulation imparting greater efficiency. Does not work well on metals having thickness of more than ¼ inches. The portable and powerful Lotos LT3500 can be the perfect choice for both a DIY enthusiast and hobbyist in terms of functionality and cost effectiveness. 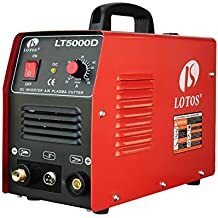 Weighing at just 18 pounds, the Lotos plasma cutter can be transported easily around your job site as it cuts through 2/5-inch metal with utmost precision. 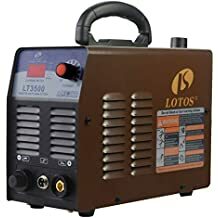 Setting up the Lotos plasma cutter is extremely easy as you just have to connect the pre-installed NPT 1/4” industry type D plug to the air compressor using the stand coupler of your air compressor. 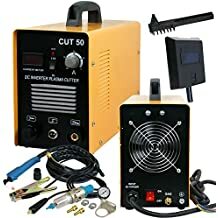 You can even connect the machine to your 110V wall outlet and start with your plasma cutting operations instantaneously. It ensures a clean cut every time using non-hazardous compressed air which can take on mild steel, alloy steel, stainless steel, aluminum and copper like an absolute pro. Its pilot arc feature enhances the device life and makes it the go-to option for slicing through rusted metals. The pilot arc is extremely beneficial in cutting mesh slots and wires. You can thus finish your cutting job with maximum ease without having to start and stop your plasma cutter time and again. The torch is kept lit throughout the span of operation by the pilot arc as it allows the passage of current to the tip from the electrode without coming in contact with the metal which is being cut. Features an efficient cooling fan system. Comes with ground clamp, consumables, power supply, gauge and pre-installed air filter. Replacement consumable from Lotos comes with a hefty price tag. 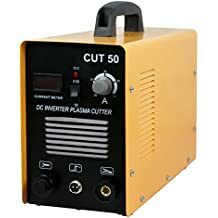 This 50-amp plasma cutter utilizes electron circuit in its operation of producing a constant current output which can also be adjusted in sync with the nature of material to bring along excellent performance. Coupled with such attributes, the Suncoo plasma cutter can weld through copper, stainless steel, iron, carbon steel, aluminum and similar metals. The smooth cutting surface of this easy to assemble device makes it easy to operate by inverting the frequency into high frequency and reducing the voltage to commute current and generate a powerful direct welding current aided by its PWM technology. With dual voltage capability of 110 and 220V, the multi-functional device is well-braced to take on a wide variety of applications such as light industrial usage, sheet metal fabrication, ducting work, automotive, site work, repair and maintenance services and many more. The digital LED display makes it easy to gauge pressure and controls as it provides 1.8 times higher cutting speed compared to flame cutter. Once you switch on the power button, the pressure and current volume gets displayed accordingly. Gas pressure can be adjusted according to the desired level so that the device can unleash ultra-strong power. For deriving best performance, it is advisable to use the device within temperature range of -10 to 40 degree centigrade and dampness level which should not exceed 80%. To make the most out of this plasma cutter you should ensure that the working area is well ventilated. Lightweight model having a compact design. Needs regular cleaning and maintenance. Might harden the edge of the material which is being cut. This 40A plasma cutter provides quality cutting through metal such as stainless steel and carbon steel having thickness of 8 mm. It offers maximum severance thickness of 12 mm although the speed will be low in that case and the quality will also be below par. It can also be used for slicing through copper and aluminum although the results might not be as good as carbon and stainless steel variants. You can utilize the air pressure adjusting equipment for operating the device even when the air pressure is extremely high. The electro circuit offers protection against over and under voltage thus adding to the longevity of the plasma cutter which can slice through metal plates in different routes. Provides protection against high and low voltage fluctuations. Air pressure adjusting equipment helps in operating the device when the external air pressure is excessively high. Ground cable does not attach to the unit securely. With an efficiency of 85% and duty cycle of 60%, the F2C plasma cutter can cater to all your cutting and welding requirements with much ease. With such statistics, this device can serve as the perfect pick for both DIY and professionals who work for longer shifts and on metals having different thickness level. Both 110 and 220 volts is supported by this plasma cutter which comes equipped with a digital read out in the front portion thus aiding in its usability from the very first time. This plasma cutter can cater to a large variety of metals such as copper, aluminum, steel etc. The efficiency of this plasma cutter is dependent to a great extent on the quality of material which you are going to cut. Thus, the cutter will produce better results if the material is clean as compared to a material having plenty of impurities. A switch integrated on the front of this unit helps in keeping the consumables cool as it offers 2.5 to 5 seconds of delay in between successive cuts. Comes with a complete kit. Extremely portable model having a budget price tag. Controls and setup are easy to understand. User manual is not of much help. A plasma cutter can suffice as your perfect tool if you are working on a metal having thickness of less than 1 inch. This efficient process leaves very few debris compared to oxy-fuel cutters making it the perfect pick if you wish to benefit out of considerable time saving. Plasma cutting technology has reached such heights that it can be afforded by both hobbyists and professionals of modern times. It might be cumbersome to select an equipment given an array of manufacturers and models vying for your attention. 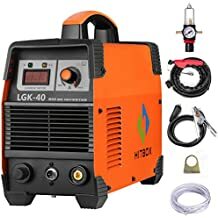 But our list of top ten plasma cutters is surely going to guard you back on your metal welding job with its versatile functionalities.